Visit Caroline's new art gallery! located at The Hyatt Shops at Piñon Pointe! Well after several weeks of conceiving and a few thumbnail's of the idea I have completed the final drawing. This really is exciting to finally be able to add color and texture to a flat piece of white watercolor paper and have this wild pony take on a personality all her own and if you will me please give me a little imagination "Wild Pony Star" may just FLY!!! Now in your minds eye please see this pony looking back on her rump where there sits a small yellow bird. Remember that Star is her name and she really belongs soaring in the beautiful limitless sky. If only she had wings maybe just maybe she could fly, however she only has three painted feathers tied to her tail. She has always had stars surrounding her and envisions many paths she could take. We all have things that hold us back from reaching and obtaining our goals. The mind can let you break free or it can bound you down with what we may perceive as real. 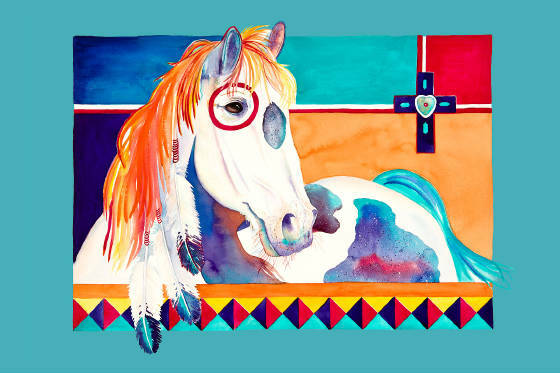 So it is that Miss Wild Pony is of many colors. You Know the colors she likes the ones that make her feel Strong and help make all things possible. The process of creating the wild series has opened my mind and imagination . It really has set a small part of me free. While I am still looking for an artistic balance of color and design the journey has allowed an unspeakable freedom of expression. The thing with a painting is to let the viewer unlock his mind and allow a brief moment in a hectic life, to pursue a place where he can go to soar or even just to dream his own little dream. For we really do have the God given power to use our mind to alter reality. The trick is to keep looking and choose wisely the place we allow our minds to go. 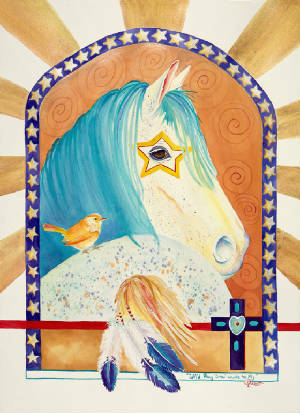 Now you will just have to wait to see "Wild Pony Star Wants to Fly"
Welcome to Watercolors by Caroline Linscott! Watercolors by Caroline Linscott offers Art Collectors and Art Enthusiasts alike to browse the beautiful Watercolors by Caroline Linscott! Feel free to browse Watercolors by Caroline Linscott’s Gallery; Original Watercolors by Caroline Linscott, Reproductions of Watercolors by Caroline Linscott, and greeting cards are available for purchase. At Watercolors by Caroline Linscott you can find out about upcoming watercolor workshops, watercolor classes, and upcoming Art Shows. Caroline Linscott offers group watercolor classes for youth and adults, for beginning watercolor, intermediate watercolor, and advanced watercolor. Prices and availability vary for watercolor classes. For more information on watercolor classes and the watercolor class schedules please join our mailing list! Watercolors by Caroline Linscott strives to provide the finest and highest quality original watercolors and reproductions! Caroline Linscott has a passion for painting and paints with a passion. 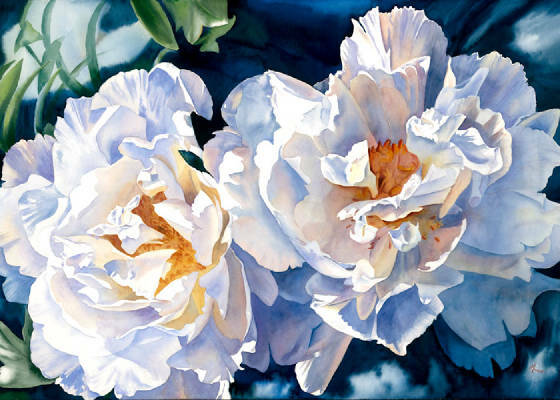 Every Original Watercolor by Caroline Linscott is completely unique and carefully crafted using the highest quality materials. Caroline Linscott does take commissions! For more information on Original Commission Watercolors by Caroline Linscott, please join our mailing list! Pricing is based on a case by case basis. Art has been the template to my greatest life experiences. I am motivated and deeply inspired by the nature I find around me. I’ve learned to look deeply into my subject to discover the minute details that absolutely thrill me, so my viewers can also enjoy the beauty that by just glancing they would miss. I see far more than I am able to put onto paper, which keeps me passionate about my work, and inspires me to see more and paint more.